Like magic, the disability that would profoundly shape Frida Kahlo’s life began with a puff of glitter. On her way home from school with her then-boyfriend in September 1925, the bus she was riding collided with a tram. The 18-year-old was struck through the pelvis by a metal handrail. One fellow passenger was a local artisan, whose bag of gold dust was thrown up on impact. The beautiful horror of Frida Kahlo’s impaled body, kissed with gold all over like a divine fresco, is one that speaks to her life as a disabled person, in which fashion and adornment could make beauty out of pain, and ultimately allow the artist to take possession of her situation. There’s no better place to make sense of such contradictions than Mexico, a culture where death lies so close to the beating heart of life, and the deceased are celebrated in bright, polychromatic body paint, artificial flowers, and cathartic parades that burst forth in the streets. Death is always close, for anyone, but in Mexico it kind of gets under your skin. When I told friends I was going to Mexico City ahead of this month’s V&A exhibition – entitled Frida Kahlo: Making Her Self Up – there was nobody who had not heard of her. She is, after all, the most famous female artist of all time (in fact, she’s one of the most famous artists full stop, but her gender is inextricable from her confessional, feminist works that speak to the pain of womanhood like no other). But I did find that few realised she was physically disabled. 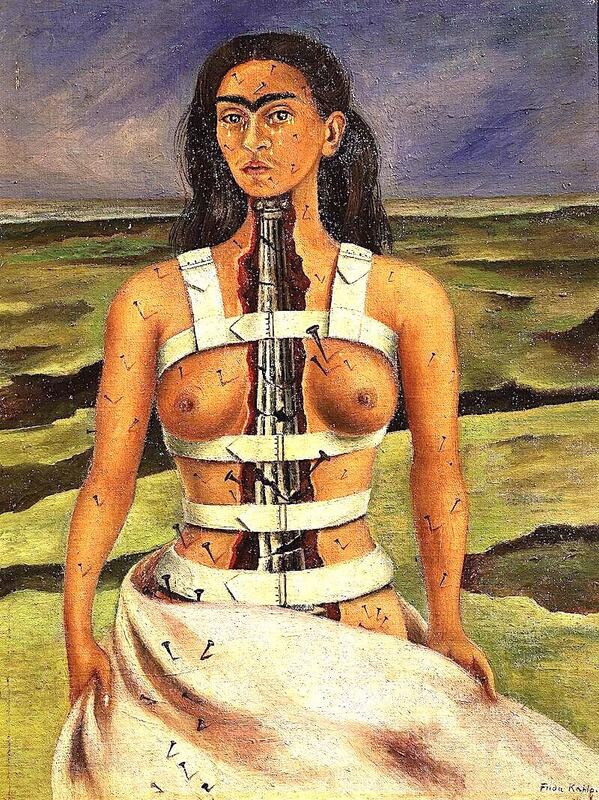 After suffering from polio aged six, Kahlo was already familiar with the awkwardness of a weakened, growing body. But in the bus accident, she sustained a broken spinal column, a broken collarbone, ribs, and pelvis, 11 fractures in her right leg, a crushed foot, and a dislocated shoulder. The metal rail, in the cruellest twist, pierced her abdomen and her uterus, leading to the infertility that was well-documented in her paintings. 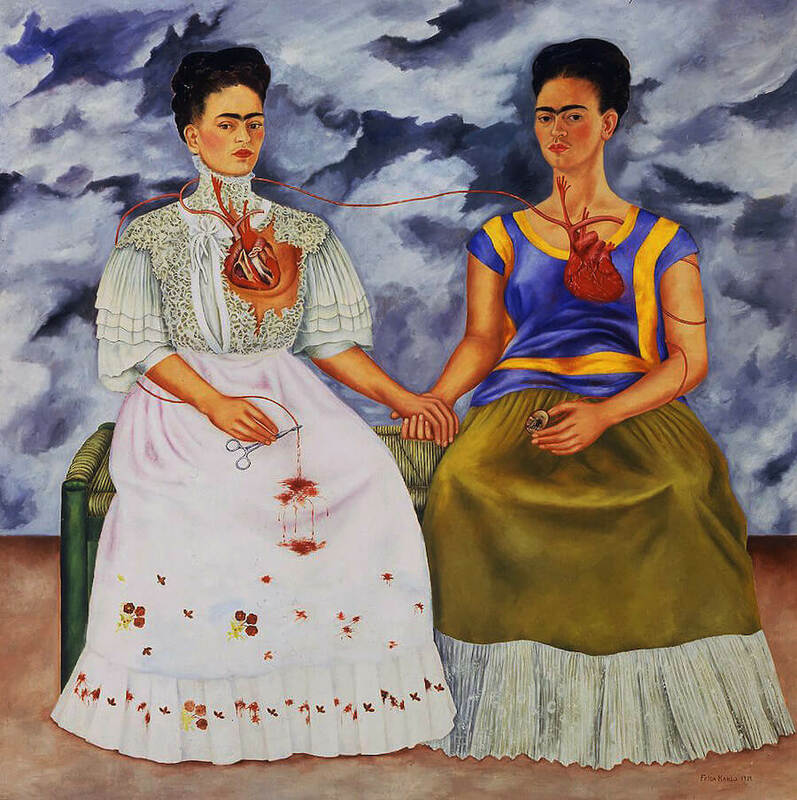 That few people realise the extent of Kahlo’s disability is testament to the image of awesome strength she projected (an image of able-bodiedness in part helped along by Salma Hayek’s seductive, salsa-dancing portrayal in Hollywood biopic Frida in 2002). 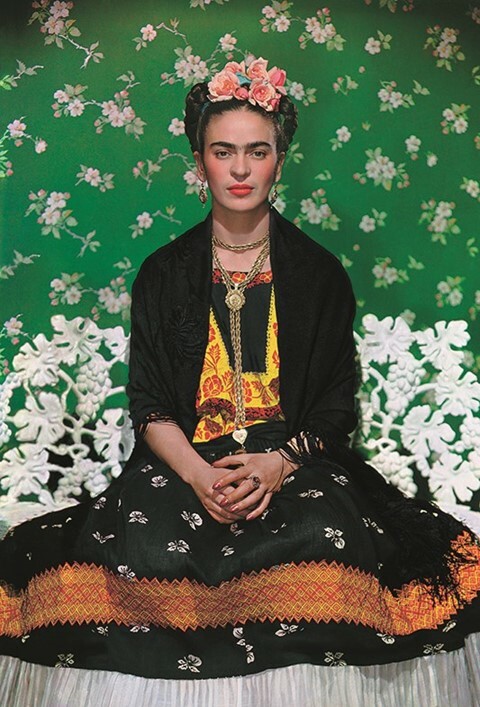 Through the hundreds of photographs of Kahlo taken throughout her life – André Breton, Edward Weston, and Nickolas Muray are just some of the famous photographers who obsessed over her image – she was able to spread a self-made iconicity that detracted the gaze from her bodily weaknesses. Looking at some of the photos on display at the Blue House in Mexico City – the iconic, azure-hued home where Kahlo was born, grew up, lived with artist husband Diego Rivera and, later, died – it’s the directness of Kahlo’s gaze that strikes you the most. In one photo by Lucienne Bloch, she bites at her necklace while staring right through you; in a shot on a Manhattan roof with Nickolas Muray, who was her lover, she holds a cigarette and shoots someone outside the frame a perceptible side-eye. But at least some of this spirit of modernity, where her love of the camera seems to speak to our own self-aware, constantly photographed lives, actually derives from Kahlo's pain. The defiant, straight-backed posture was as much due to a back brace she was forced to wear to support her spinal column as it was her confidence; the iconic floral adornments of her face and hair, a ploy to distract viewers from her practically destroyed legs and crumbling upper body. 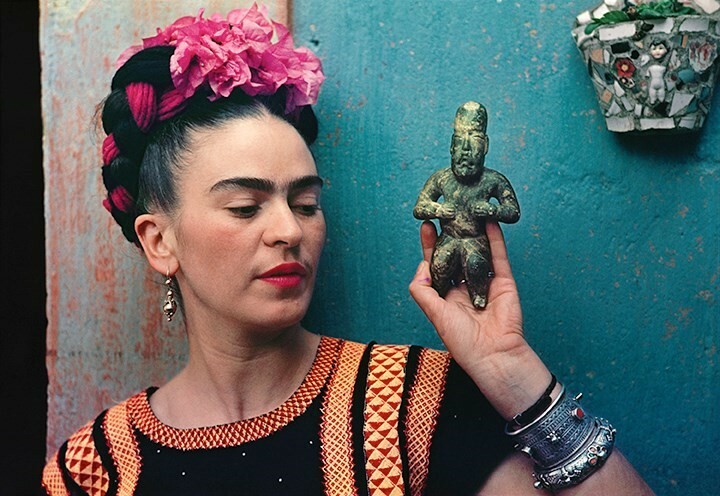 Some of this awareness of the power of self-image may have come from her father, who was a photographer by trade and taught baby Frida how to pose. 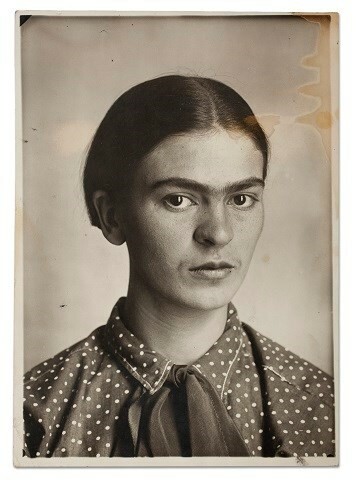 What’s more, during her months of confinement to a bed after the bus accident, Kahlo mastered the art of self-obsession. Every day, while she lay horizontally (you can see the bed she was confined to in the Blue House), she gazed into a mirror above the bed: at her own body, and her own face. This circling of her self-image and identity would contribute hugely to her art when she later came to pick up the paintbrush: her self-portraits bleed on to the page with references to her marriage, her infertility, and her disability. But in another, less discussed way, that time spent peering into the mirror contributed to the creation of a self-image that would not be defined by suffering. 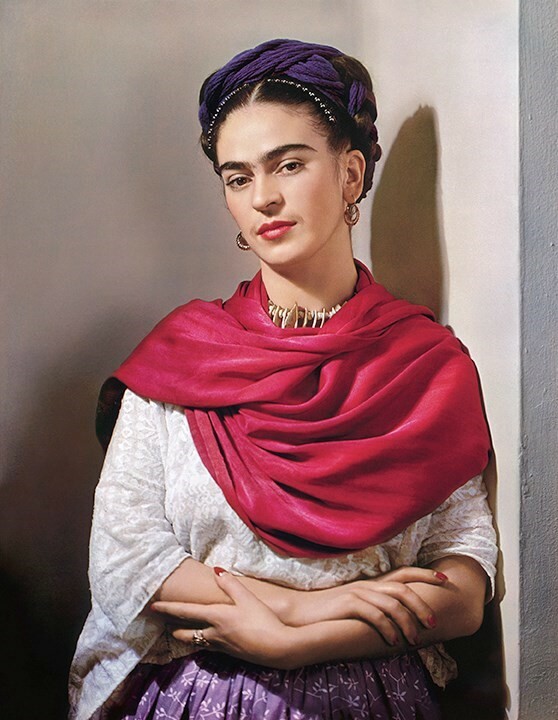 Much like a generation of young people today, Frida knew how a constructed self-image could empower; and the worse she felt, the more she drew attention to her clothing. 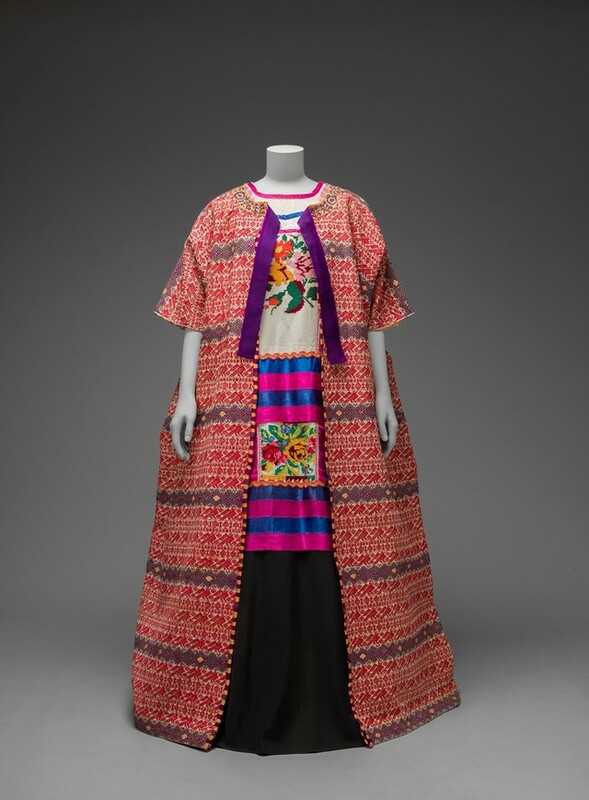 “Frida was aware of the power of clothes from a very young age,” says Circe Henestrosa, the co-curator of the V&A show who created the exhibition’s originator. “Her fragmented body would inform her wardrobe as much as it was to inform the constant pain of her existence and the core of her art.” In the V&A exhibition – which offers a more personal glimpse into Kahlo’s interiority by showing her clothes, jewellery, make-up, medicines, and prosthetics alongside some of the visceral paintings they feature in – Kahlo’s disability plays a central role to Henestrosa and Claire Wilcox’s curation. 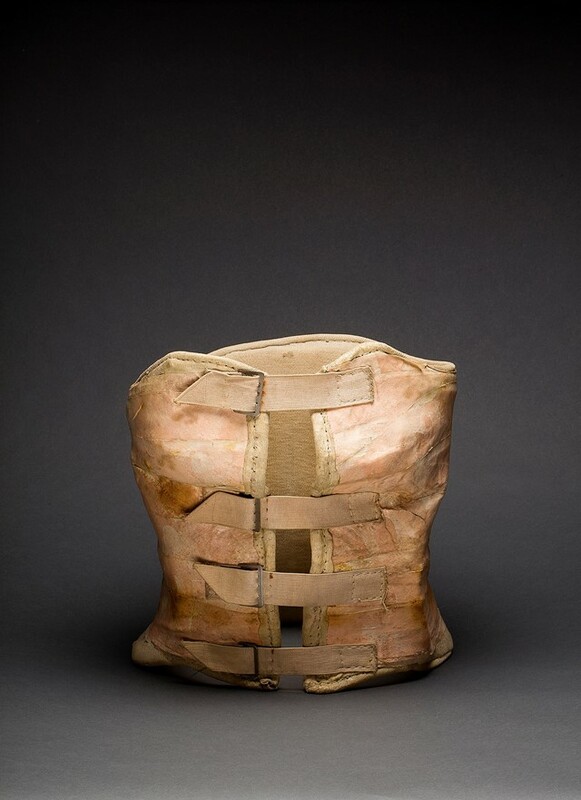 The most brilliant object of Kahlo’s in the exhibition is one that, appearing very close to her death in the summer of 1954, was one of her final statements of determination to adorn herself even when at her absolute lowest. Kahlo’s right leg became gangrenous in 1953, and had to be amputated below the knee. In a lifetime of over 30 surgeries in the USA and in Mexico City, and a near-constant battling of pain, having to wear a prosthetic seems to have been a final devastating blow. 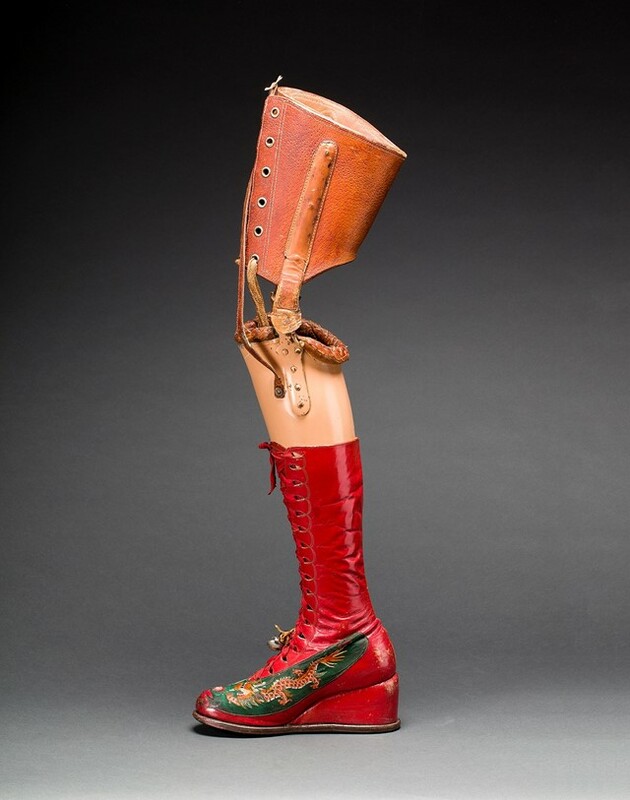 But even then, Kahlo made her prosthetic leg into a statement of her identity. “With (the prosthetic leg), Frida is taking possession of something functional and ugly and making something beautiful and moving,” says Wilcox. The leg has a bright-red boot with bottle-green, Chinese silk embroidery in pink and white; the boot is lace-up and fits perfectly, and the wedge heels are the same height, like a corrective for her normally mismatched leg length. The fact that the long skirts Kahlo wore would cover the boots anyway is why their deliberate adornment is so key. Mullins walked in McQueen’s SS99 show wearing two carved prosthetic legs, a bold visual statement that celebrated the beauty of extreme difference without it feeling like a novelty. McQueen’s interest in disabled representation wasn’t a play for sensationalism; within the show, what was most powerful was how her appearance in the legs went unnoticed, as the real ‘show’ was when Shalom Harlow was sprayed by robotic arms at the end. At the time, Mullins said, “His clothes have always been very sensuous, and I mean the full gamut of that. So hard and strict and unrelenting, as life can be sometimes,” a statement that seems to relate to Kahlo’s own situation and unflinching approach to dressing. Writing in a book of Frida Kahlo’s personal archive of photos, writer Maurizio Ortiz calls the mirror “the body’s most immediate reference”, and desire “its most complex one”: “There are between them numberless ways for the body to become aware of itself and find its own reason to be.” After months gazing at herself in the mirror following her accident, Kahlo used clothing to find a way for her body to be, and for her to become her truest self. It’s an important example of the ways in which dress can offer self-determination and strength to those who are not able-bodied. Finding joy in difference is something a younger generation of disabled youths online are leading by example on. As per Aaron Philip and Sinéad Burke’s examples, it’s the next diversity frontier to smash – and the first step has to be visibility. When Kahlo’s leg had to be amputated in 1953, she wrote in her diary, “Feet? What do I want them for, when I have wings to fly.” The icon’s technique of fashion-as-survival is a lesson in how adapted forms of clothing can not only meet the specific needs of the physically disabled, but empower them at the same time. And, what’s more, disabled people may want to adorn themselves, to take charge of that choice. Ultimately, it’s the people who make our clothes who should take their cues from Frida Kahlo’s beautiful, painted, sparkling, broken body.